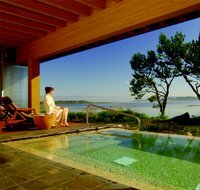 Opened in June 2005, the Spa at Salishan overlooks the tranquil Siletz Bay, ideally situated to provide the ultimate sensory escape. Discerning guests find comfort in private whirlpools, while in every treatment room, a warm hearth flickers. The spa's architecture integrates natural light and textures to blend effortlessly with the surrounding resort while creating a unique and solitary space. The spa menu includes a full slate of services for men, women and groups in this one-of-a-kind Oregon Coast setting.